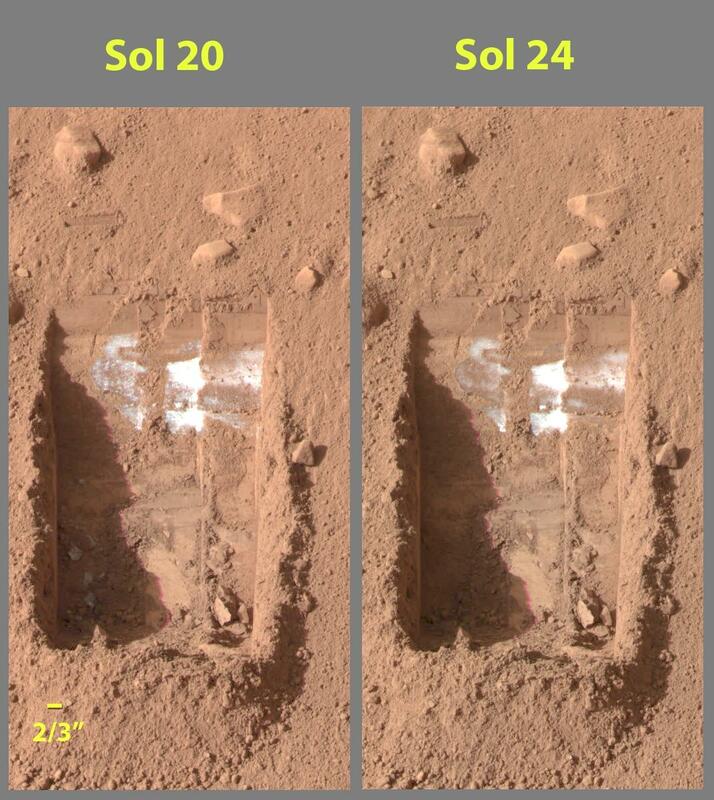 Explanation: Compare these two close-up pictures taken on sol 20 (left) and sol 24 of a trench dug in the Martian surface by NASA's Phoenix Lander. Those sols of the Phoenix Mission (a sol is a Martian day), correspond to June 15 and 18 on planet Earth. Light-colored, dice-sized chunks, visible in the lower left shadow region of the trench in the sol 20 image have vanished by sol 24 -- a strong indication that the chunks were ice uncovered by digging the shallow trench. The vanishing act likely demonstrates the sublimation of ice in the trench, a process similar to evaporation, in which the ice went directly from solid to gas after it was exposed to sunlight and the thin, dry Martian atmosphere.